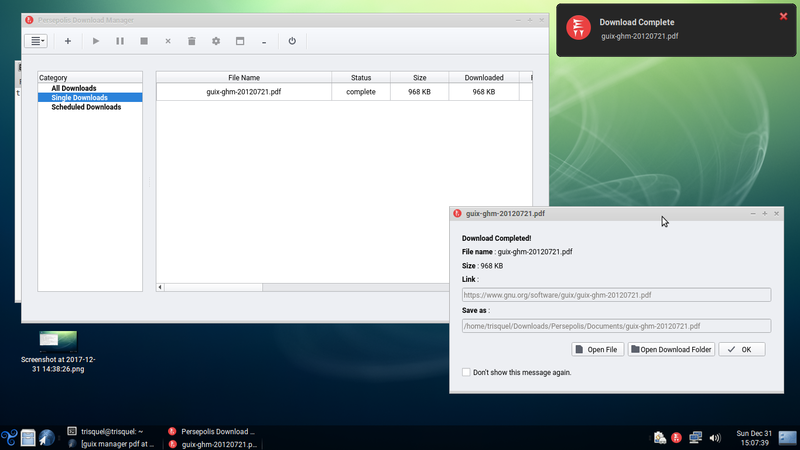 This tutorial explains steps to install Persepolis Download Manager v3.0.1 on Trisquel 8 "Flidas" and how to integrate it into Abrowser 57 ("Firefox Quantum") and GNU IceCat. Thanks to AliReza (the developer of Persepolis) who have pointed out that Persepolis 3.0.1 has been available! Enjoy Persepolis! Note: Trisquel 8 is compatible with Ubuntu 16.04. At least since v3.0.0, Persepolis has a new integrator addon for Firefox 57 (hence also for Abrowser 57) available at Mozilla Addons website. You can install it from https://addons.mozilla.org/en-US/firefox/addon/persepolis-dlm-integration/. At Trisquel 8, as per 31 December 2017, I can only find v52.3 that is far older than Firefox 57 "Quantum". So, to integrate with IceCat, you don't need the new addon, you just need FlashGot Addon and follow my previous instruction here.